Caption slip reads: "Photographer: Mitchell. Date: 1954-09-30. Assignment: Optimist luncheon honoring Oscar Smith. L. to r., 59/60: Oscar A. Smith retiring pres. 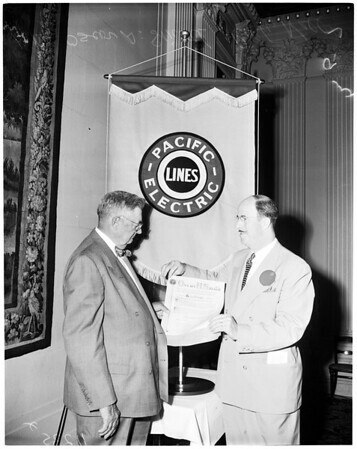 of Pacific Electric receives scroll from supervisor Roger Jessup. 57/58: Oscar A. Smith retiring pres. of Pacific Elec. receives scroll from Roly Nall past pres. international pres. of the Optimist Club".